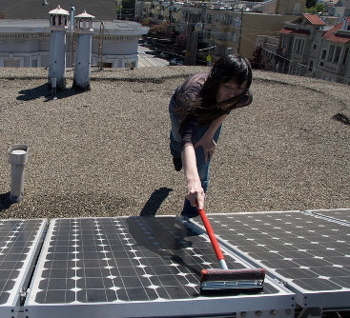 Solar panel cleaning is not that different from cleaning your windshield. You can do it yourself, or have other people do it for you. A solar panel typically consists of solar cells covered by a protective glass coating, and just like your car windshield – the longer it's outside – the more likely it will get dirty and need to be cleaned. How much Electricity do Dirty Solar Panels Lose? Pollution, traffic dust, leaves and even bird droppings contribute to preventing sunlight from reaching the solar cells in your solar panels. 1. Physical Inspection: Inspect the solar panels on a periodic basis (frequency depends on location or the manufacturer's specifications) to remove any debris and dirt and ensure all connections are tight. Generally, speaking dusty areas typically require more frequent inspection. 2. Use a Monitoring Service: Another way to make sure you’re getting the most solar potential out of your PV system is through a monitoring systems and service. For a monthly fee or a flat up front cost, you can monitor how your system is performing. Your system is expected to produce a certain amount of power during each month. A solar monitoring system can tell you if your system is off line or if it’s not performing as expected and run diagnostic programs. Solar monitoring systems can also be educational, showing you how much power you’ve saved, how much CO2 you’ve saved, and how much money you’ve saved. Depending on the monitoring systems, you can access your information from the web, from a wall mounted-device, or even from your iPhone or other mobile device. Monitoring systems are usually an extra expense, whether as a monthly service or purchased up front. While not essential, they do make troubleshooting and system performance easier to see. So if it turns out your panels are dirty – what are your options? If you can clean your windows – you can certainly clean your solar panels. The hard part (especially for roof mounted solar panels is reaching them). Assuming you can reach your solar planels - clean the surface of a solar panel much like you would clean your car -- with warm water and dishwashing soap to remove any accumulation of dirt and grime. Some people like to clean their own cars – and others like to take their cars to be cleaned for them. Same with solar panels – except that the solar panel cleaning company obviously has to come see you. Depending on where you live, ask your installer to recommend a solar panel cleaning service and find out how often the cleaning is recommended – and what it costs. Be sure they are insured – in case there are accidents. If they don't have a cleaning service in your area – consider starting a solar panel cleaning service yourself as there is a growing need for such services. Basically a nano-cleaning product – such as NOC on Solar can reduce the need for frequent solar panel cleaning – and if you live in an area where it rains often – using a nano-cleaning product lets the rain to most of the cleaning work for you. In a drier area – your panels can be cleaned using an air-hose (if there is water rationing) or a garden hose (if water is easily available). Note: This product can also be used to keep your windshields clean, your showers, clean, help prevent graffiti, etc. It's really an amazing product. Just like they make swimming pool cleaning robots – they also make robots that are good at cleaning solar panels. If you just don't want to ever bother with cleaning your solar panels - one solution that is becoming more popular, especially as a result of new thin-film solar cell technologies – is the production of what is known as BIPV (Building Integrated PV). Basically, these are solar panels that both protect your roof and produce electricity. For new homes … or people needing new roofs – this can definitely worth looking into.